What do Gina Rinehart, Christine Holgate and Shelley Sullivan have in common? Gina Rinehart is the billion-dollar mining magnate at the helm of Hancock Prospecting, Shelley Sullivan the force behind powerhouse beauty brand ModelCo and Christine Holgate the former head of Blackmores and current CEO of Australia Post – two of Australia's most well-known brands. The trio have all built successful careers in their own right but that's not all they have in common. 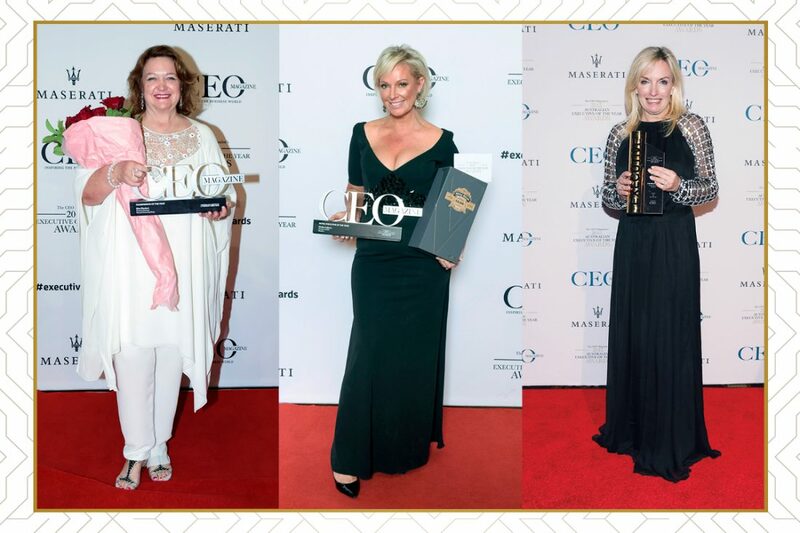 Rinehart, Sullivan and Holgate have all taken out awards at The CEO Magazine‘s Executive of the Year Awards. When Christine Holgate was awarded CEO of the Year in 2015 at the fourth annual Executive of the Year Awards, she told The CEO Magazine that she won plaudits from competitors in her industry as well as international figures. What was most overwhelming to her though was the response she received from other female leaders in the business world. “The support has been incredible,” she told The CEO Magazine at the time, “especially from women congratulating me on becoming the first woman to win CEO of the Year”. While then-CEO of Blackmores, Holgate had more than doubled the company’s profit, overseen expansion into China, increased employee engagement and seen market capitalisation of almost A$3 billion. It was for those successes that she was able to take out the top prize, becoming the first female executive to have won the major award at the The CEO Magazine‘s prestigious ceremony. Holgate’s career has continued to flourish since the win, and today she heads up Australia Post as its CEO. Since that evening in 2015, there hasn’t been another female leader to take out the CEO of the Year Award. Holgate came close again in 2016 after making the list of eight finalists but was pipped at the post by Stephen Cornelissen, CEO of Mercy Health. For the past two years, Shelley Sullivan, founder and CEO of ModelCo, has been the sole female finalist in the major category. While she didn’t win (the award went to Michael Ebeid, former CEO and Managing Director of SBS, in 2017 and Mark Nielsen, APAC CEO and Executive Director of Talent International, in 2018), she recommended the experience and said she was thrilled to take out her industry category in 2017 – Retail Executive of the Year. Upon accepting the trophy, Sullivan prompted other women to throw their name in the hat, highlighting that their achievements were just as worthy of being recognised as their male counterparts. As well as the highly sought-after CEO of the Year Award, there are 23 other categories covering a diverse range of industries and roles. The cohort of female leaders to win awards over the years has been small but impressive. It has included the likes of Gina Rinehart, Executive Chairman of Hancock Prospecting Group, who won Chairperson of the Year in 2013, 2014 and 2017 and Ann Sherry, Chair of Carnival Australia, who took out Chairperson of the Year – Runner Up and Hospitality and Tourism Executive of the Year in 2017. In 2018, five female leaders took out awards. This included Kate Massey, CMO of JCurve Solutions, who won Young Executive of the Year, and Emma Hendry, CEO of Hendry Group, who won Building and Construction Executive of the Year. Hendry’s win in the Building and Construction category was particularly momentous as she was the first woman to do so since the advent of the event, an achievement she touched on after accepting her award. “I’d like to say that I’m also proud to see an ever-increasing number of female nominees and award recipients, something which I hope will go to show the shrinking disparity in opportunities for women to lead socially, politically and industrially,” she said. With applications now open for the 2019 Executive of the Year Awards, The CEO Magazine encourages female executives across Australia to get involved and share their professional story. Will 2019 be the year that a female executive is crowned CEO of the Year again? Find out more about the 2019 Executive of the Year Awards and apply today.